I speak now as the Immortal Magdala. I call to you from the heart and the Source of the Union of the Christ Yahweh. I lived upon this Earth as you do knowing sorrow and joy, inspiration, and affliction of the times when my heart became so heavy that I felt I had nowhere to go and no one who would receive me. At those moments of utter despair, I turned and faced my Beloved and through time and space he embraced me because I knew he truly shared soul essence with me as our union was a source of pure ecstasy and love beyond the limits of human experience. To know the joy of the embrace brings us closest to the Source of our own union with the pure light of Creation. The Embrace of the Beloved. 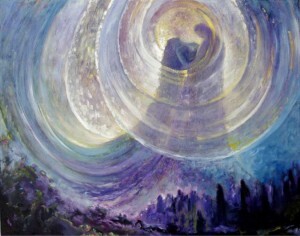 Painting by Rassouli. I speak to you now because this is not something that can be denied you. It is not something you can lose. You were born of love, and there shall you be throughout eternity. I speak to you of the pure ecstasy I experienced when first as a woman I looked into his eyes as a man and fell deeply into the blue, blue light of his soul. Our eyes met and embraced. We had known as children the joy of our companionship and then years of time of preparation and separation to prepare me for womanhood that I would meet him again as a woman and He me as a man. Did we in those days embody the one living God? Most certainly, because through this union that was perfection and Divine, we made the way for humanity to experience love without limits. As truly children of God you’re capable of living and loving without harming each other, and this is grace. I stand here as your witness now. I see your hearts cry out for such a love and your minds casting shadows of doubt. Is this an illusion, this Godly love between humans that injures not but lifts each one up as adored and Beloved? I say to you now, Beloved Ones, adorn yourself as I did as a bride and He as a bridegroom and prepare to meet your God Self through this union. Your heart will flow forth with love that knows no end. And we were to live that in those days, that every moment that I sat at his feet that he spoke, every moment that He, He lifted me up from my mission and my Godly purpose was a shared joy for us and never a moment that soured us to this love. Together our part, it truly, truly Beloved Ones, was a source of grace as we met ourselves heart to heart in the mirror of the souls. Open now, open now to this promise of union and meet yourself in the mirror of the souls that you meet others and that you may truly know the ecstasy of eternal union; that every moment that you breathe is a moment of love and a purpose for your existence to see the love in the world, to hear from the place of deep compassion and grace for all living things and all beings with a sense, a deep sense that you are capable of embracing their light and loving, loving, loving the shadow within the human heart that brings forth the illusions of fear and separation. Thus now, this Grail lives upon the planet. It has awakened. The Holy Grail is not a place beyond your reckoning or mystical force that you cannot claim. It is found in your heart, Beloved Ones, and found in your pilgrimage of love. Be as I AM. I AM Magdala Yahweh. Blessed be, so be it and so it is.